* Free of Charge Responsible Recycling for Obsolete Technology (All hard drives (unless otherwise requested by customer) accepted for recycle are automatically and immediately destroyed per NIST standards Publication 800-88 Revision 1 . They are then melted down with like hard drives/ metals at our R2 Certified Refinery. These services are standard and free of charge. They all qualify for our in house Certificate of Destruction & Recycle. * In House Certification (free of charge as stated just above) or Third Party Data Wipes with Certification and Reports ($6 per hard drive with minimum quantity 300 hard drives or other types of media and up) Please call for more information. * Free of Charge Residential Computer & Electronics Recycling Drop off Option (drop offs accepted near our front door/ in our recycling box and processed daily). AfterTech or its employees are not responsible for any loss or damage due to the results of these or other suggestions. We do agree that it is a best practice to destroy or wipe any/all sensitive data before handing over to recycling or other companies for re-use or destruction. Or we can accept hard drives destroyed in any manner or computers with out their hard drives if you prefer to keep the hard drives yourself. As previously stated and guaranteed, we will destroy all hard drives upon receiving them and ultimately melt them down with like metals whether you wipe and/or destroy them yourself or not, per NIST standards listed in Publication 800-88 Revision 1 . DROP OFFS: We started offering the free drop off of items needing recycling after receiving so many requests from local residents. Although not our primary market or business, we are happy to be of service to the local community and environment by recycling residential obsolete or broken electronics.NO Tube or Projection style TVs or CRTs / Only Flat Screen LCD Style TVs & Monitors accepted at this time Please. We are working on trying to put together a service for recycling TVs/CRTs on the now much larger scale. Please look for information about this soon. We may need some co-operation from the public and local businesses to implement this new service. Residential/Small PICK UPS: We can provide pick up service for local residents for a small fee, locally usually $35-$50, depending on location; payable at time of service via cash, company check or Credit Cart / PayPal. This fee is solely to cover our own labor, gas, overhead costs which we try very hard to keep as low as possible for you and for the sake of the environment. Old Tube/Projection Style TV's & CRT's: Currently we are taking a break from and getting caught up on an overwhelming amount of tube and projection style TV and CRT recycling. We hope to resume this service soon. Commercial Pick Ups: Free of charge with minimum of one pallet LOCALLY (about 500lbs or 25 computer towers or comparable). The minimum requirements for free pick ups will change the further a business is away from our location. This is to cover our costs only. Please feel free to contact us with any questions about what might be considered comparable to the minimums stated above or for a price quote if you do not meet the minimum requirement. AfterTech, Inc. is happy to provide references upon request for any of our services. To make safe, easy and affordable for everyone, the recycling of hazardous, harmful and obsolete technology! A world where reducing, re-using, and recycling all technology is common. We are happy to work with your schedule upon request. The drop off of items for recycle near our front door / in our recycling box near our front door is monitored 24/7 by security cameras, staff and our neighbors. AfterTech is the Leading No Charge Recycling Resource for Oklahoma School Districts, Non-Profits, Banks and more. For over ten years we have safely and securely picked up, recycled, sanitized, destroyed and insured the safety of the sensitive data on computers and other IT technology from these organizations at no cost to them. Items not re-used, donated are transferred to our local R2 Certified Recycling Partners. We recycle and perform data wipes for individuals, organizations, communities, events, projects, businesses, wherever we are needed! No cost/Low cost Pick Ups, Recycling and Data Wipes. *Some hazardous waste can only be disposed of at hazardous landfill sights which do charge. This information can be found at the DEQ or EPA sites online. For this reason, we reserve the right to charge or to pass on only a large amount of tube or Projection Style CRT's or TV's or similar. Always no Charge Pick Ups and Recycling locally for Schools, Churches, Faith based entities and possibly other extenuating circumstances. We can provide a Certificate of Recycle and Data Destruction/Media Disposition according to NIST HIPAA Compliant/, free of charge. A copy of our in house audit/inventory is $1.00 per item for those wishing it. Third party certification of hard drive data wipes is only $6 per hard drive, per pass (1-3 pass using zeros or other digits); depending on volume (300 wipes minimum). We can pick up the hard drives or you can deliver them, whichever method of transporting them is easiest for you. We may charge a small fee for picking them up. Data wipes performed at your location, performed by our staff, will incur additional charges depending on location, number of hard drives, etc. Or you are welcome to use the devices and perform the erasures yourself. This incurs no additional charges. We use a top rated third party certification company (BitRaser). This service includes individual Certificates of Erasure and a full electronic report of each erasure performed. We do not require an inventory or for your items to be palatalized for us to pick up for you. We do only need enough information to determine what size truck(s), trailer(s) and crew to send. We usually hand pack our trailers for you unless you have a fork lift and prefer to palatalize your equipment and then use your forklift to place the pallets in our trailer(s). We do all the packing and moving. *Occasionally we must request packing material be supplied on very large jobs. We recycle a wide range of equipment and materials. We provide Data wipes and/or Hard Drive destruction according to NIST / DOD / HIPAA standards: Publication 800-88 Revision 1 . Free drop off for recycling is now available at our office in or near our recycling box, near our front door. We can arrange for a pickup of your computer equipment to be recycled and/or destroyed at a convenient time/location for you. We provide our own pick up crew. We can provide a copy of the audit of your equipment for a small fee ($1.00 item). We do not charge for the in house Certificate of Recycle/Media Disposition. We offer third party data wipes for $6 per hard drive/media source (minimum 300 hard drives/media sources/wipes), per pass (1-3 pass re-written with 0's or other numerical digits) via BitRaser media erasure devices. This service includes one certificate per piece of media erased and a full report of each item accessible via electronic file or print. We can not accept Tube or Projection Style TV's or CRT's at this time. However, we do recognize the need for TV recycling and hope to again resume our programs for them soon. **We are currently unable to pick up from locations with more than a few steps or up many flights of elevators/stairs unless pre-approved or pre-arranged due to insurance stipulations. Please have all equipment needing recycled brought to a location before hand near a loading dock or loading location where our trucks and trailers have easy access. Please remember, this is a free service for most companies. We do not make a lot of money doing this. Please help us to help you by having your surplus electronics ready for us to pick up at an easily accessible location. If this is NOT possible, please be prepared to pay a packing and moving fee which will be determined on a case by case basis payable at time of service via cash, company check or PayPal. We break machines or monitors down to board level in our Oklahoma City warehouse and recycle them at the appropriate Oklahoma refineries. We request a minimum of one pallet (Locally; this minimum changes with distance from our location) per pick up to qualify for our free of charge pick up (about 25 computers). Contact us for a quote to have your equipment picked up if it does not qualify for our free of charge pick up. Fees range between $45-$60 local and up further out statewide. Call for more information, to arrange a pick up, to get an estimate or a ROI (return on investment) for your newer/larger quantities of equipment or notify us of an auction you would like us to attend and/or bid on. Recycling Computer Equipment is the primary focus of our business. When our pick up crew comes to your location, they work quickly, neatly and thoroughly; are sensitive to your working environment. Our dress code is business casual. If you have specific needs for our crew while at your location, please advise us in advance. We will always do our best to accommodate your business codes while picking up your obsolete technology. Please have equipment ready for our drivers near the pick up location. We do not climb steps or take elevators unless possibly pre-arranged under certain circumstances. Never have we leaked sensitive data. All hard drives are wiped, drill pressed and melted down with like metals at the refinery. We use the NIST Publication 800-88 Revision 1 Guidelines for Media Sanitization as our guide for how to sanitize and destroy electronic media. You can view and download a copy of this publication here. We can provide a Certificate of Recycle stating how your equipment was or will be recycled. Or we can provide third party certified data wipes by a refutable and secure company. We provide a Hold Harmless/Indemnity Agreement for your protection and peace of mind stating once picked up, we are completely legally and financially responsible for the sensitive data on your obsolete equipment. This also doubles as our pick up agreement showing chain of custody. We can e-mail you an example Indemnity Agreement/Pick Up Agreement or Certificate of Recycle ahead of time upon request. Since there is a good chance we will be away on pick ups, unless previously scheduled to meet you, we allow all drop offs to be left near our front door or new recycling box near our front door to be processed upon returning. **For those with sensitive data on their media (Hard drives usually) we have been given a link, via suggestion, to show how to wipe ones own hard drives: http://ctech.link/erase-data (We are not responsible for any results due the use of these instructions. But we do agree that wiping/destroying ones own hard drive is a best practice before recycling.) 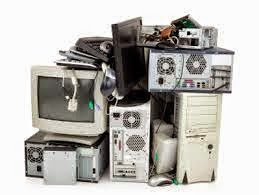 We accept computers and/or their parts in any condition; broken missing/needing to be destroyed and/or wiped (no charge for destruction which is standard procedure for all hard drives unless customer advises otherwise). Premises protected by 24 hour video surveillance and nightly security guard and dogs.